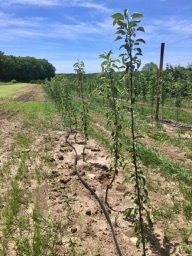 15-June (Thursday) UMass Extension Fruit Program Berry Twilight Meeting, 5:00-7:30, Nourse Farms, 41 River Rd., Whately MA. 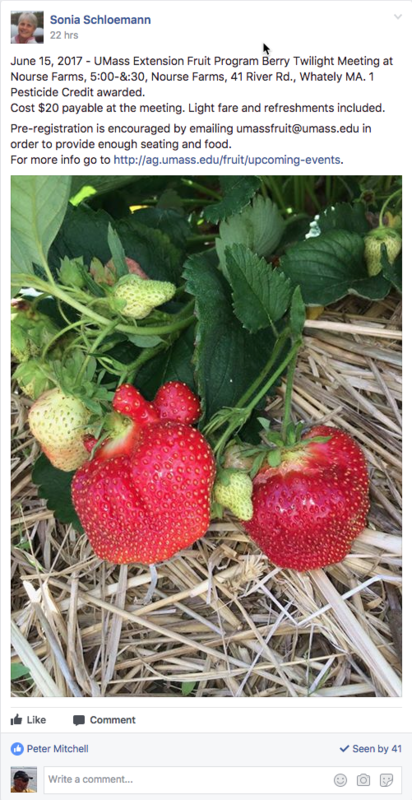 Strawberry & Raspberry Variety Showcase, Blackberry Swing Arm Trellis Demo, High Tunnel Berry Production Update, Spotted Wing Drosophila Management Research and Management Update. 1 Pesticide Credit requested. Cost $20 payable at the meeting. Light fare and refreshments included. Pre-registration is encouraged by emailing umassfruit@umass.edu in order to provide enough seating and food. For more info go to http://ag.umass.edu/fruit/upcoming-events. 11-July, 2017 (Tuesday) Massachusetts Fruit Growers' Association Summer Meeting, Cider Hill Farm, Amesbury, MA. Details TBA. Note: for 2017, we have four Massachusetts orchard locations subscribed to AR: Amherst, Belchertown, Deerfield, and Easthampton. The website for looking at AgRadar for these locations is: http://extension.umaine.edu/ipm/ag-radar-apple-sites/. What follows is the AgRadar summary for the Belchertown location. 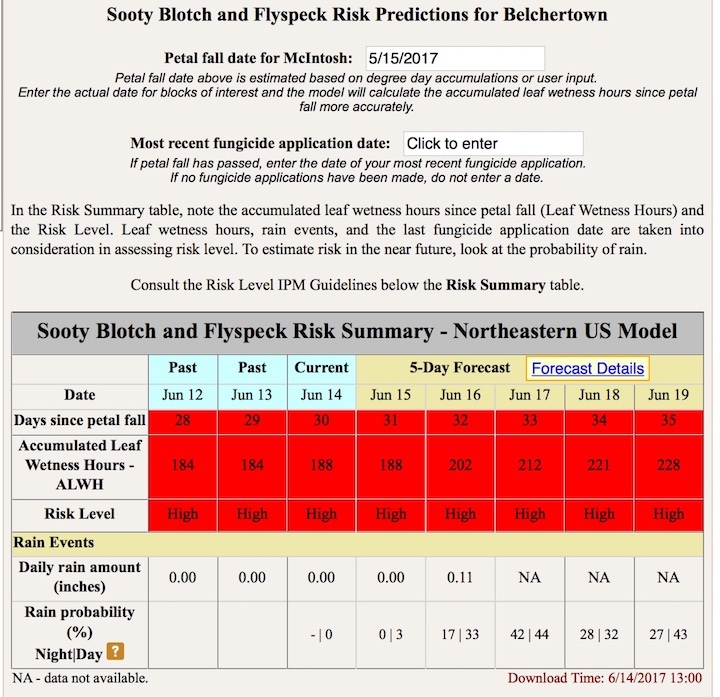 Key Apple Scab Dates -- http://ag-radar.umext.maine.edu/MAmodel/MA-Belchertown-ScabDates.htm Date of 'Final' significant primary scab ascospore release is/was: May 25, Thursday 'Final' defined as best guess of 99+% cumulative ascospore release, and high probability that at least 95% of ascospores have been released. Secondary scab protection and scouting should continue until 2nd generation lesions from the season's final ascospore release have had time to begin appearing. 2nd generation lesions from the FINAL significant primary scab ascospore release have had time to begin appearing by: June 28, Wednesday. 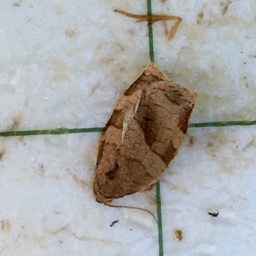 Codling moth CM -- 1st generation, first sustained trap catch biofix date: May 16, Tuesday. Codling moth development as of June 14: 1st generation adult emergence at 73% and 1st generation egg hatch at 20%. In most orchards, insecticide targetted against plum curculio and apple maggot prevent codling moth damage. If targetted codling moth control is needed, key management dates are: 1st generation 3% CM egg hatch: June 10, Saturday, = target date for first spray where MULTIPLE sprays needed to control 1st generation CM; 1st generation 20% CM egg hatch: June 14, Wednesday, = target date where one spray needed to control 1st generation CM. Dogwood borer DB -- First egg hatch roughly: June 22. Peak hatch roughly: July 27. Obliquebanded leafroller OBLR -- 1st generation OBLR flight begins around June 8, Thursday. 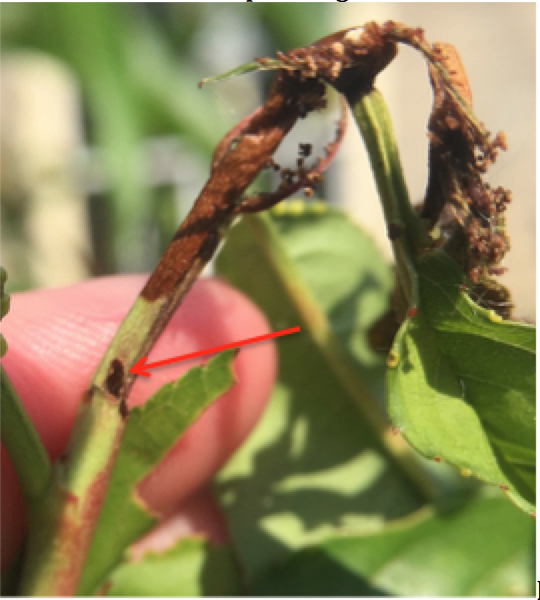 Where waiting to sample late instar OBLR larvae is not an option (= where OBLR is known to be a problem, and will be managed with insecticide against young larvae): Early egg hatch and optimum date for initial application of B.t., Delegate, Proclaim, Intrepid, Rimon, Altacor, Belt, pyrethroid or other insecticide effective against OBLR (with follow-up applications as needed): June 21, Wednesday. Where waiting to sample late instar OBLR larvae to determine need for treatment is an option, or to check on results from earlier sprays: Optimum sample date for late instar summer generation OBLR larvae: July 1, Saturday If first OBLR late instar larvae sample is below threshold, date for confirmation follow-up: July 5, Wednesday. Oriental Fruit Moth OFM -- 2nd generation OFM flight begins around: June 26, Monday. 2nd generation - first treatment date, if needed: July 4, Tuesday. 2nd generation - second treatment date, if needed: July 16, Sunday. Redbanded Leafroller RBLR -- 2nd RBLR flight begins around June 27, Tuesday. Peak catch and approximate start of egg hatch: July 11. San Jose Scale (SJS) -- 1st generation SJS crawlers appear: June 17, Saturday. Spotted Tentiform Leafminer STLM -- 2nd STLM flight begins around: June 15, Thursday. Rough guess of when 2nd generation sap-feeding mines begin showing: July 4, Tuesday. Optimum first sample date for 2nd generation STLM sapfeeding mines is July 11, Wednesday. Preliminary McIntosh harvest date forecast -- Date to apply ReTain to delay first harvest for apples which without treatment would be ready for storage harvest on September 2 is from Saturday August 5 to August 12. Date to apply ReTain to delay maturity for 2nd, 3rd or 4th pick of those apples, without delaying start of harvest maturity, is from Saturday, August 19 to August 26. Begin measuring actual McIntosh starch-iodine index no later than Saturday, August 26. The Michigan formula estimates that non-spur McIntosh will reach starch index 4.0 and start the optimum harvest window for long term storage on Saturday, September 2. Using the Hudson Valley NY formula, McIntosh maturity is forecast to reach starch index 6.0 in Belchertown MA on Saturday, September 23. Hope to see you at the UNH Tree Fruit Meeting tonight (June 14) in at Kimball Fruit Farm in Pepperell (at 5:30 PM). 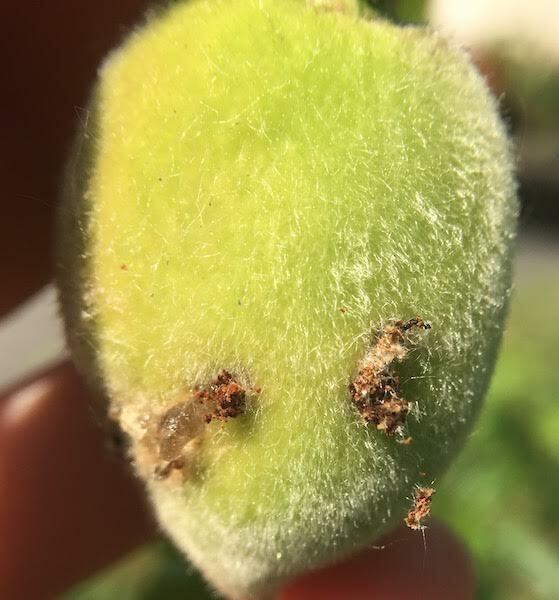 Primary apple scab season is over, but you should be continuously looking for scab lesions in the apple foliage; if you find any, Captan spray(s) during dry and preferably hot weather can effectively burn it out; if you don't find any lesions by late next week, you are officially out of the woods. Sooty blotch should not begin to become an issue until late next week in most orchards. Hah, just when you are out of the scab woods! Beginning the end of this month until harvest, continuous fungicide protection should be considered. See New England Tree Fruit Management Guide Summer spray table. Codling moth are still being caught in abundance as of yesterday in pheromone traps in our state-wide trapping network. 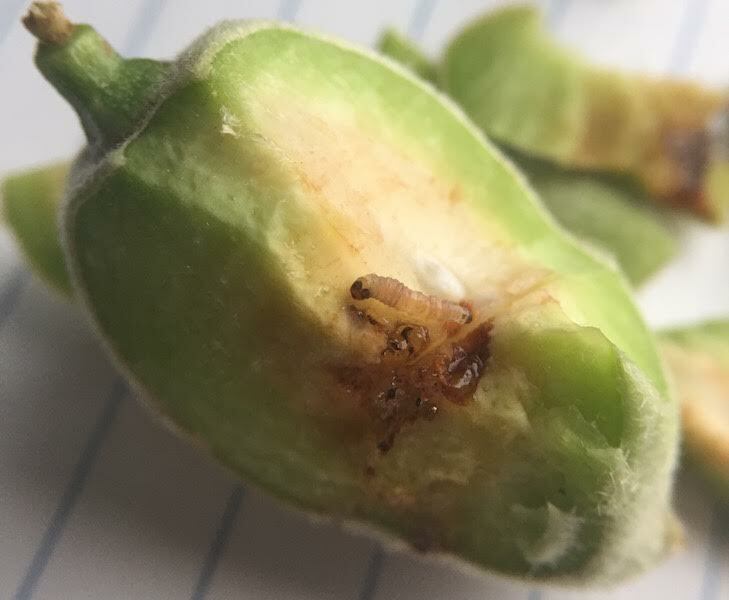 According to AgRadar above, "1st generation 20% CM egg hatch: June 14, Wednesday, = target date where one spray needed to control 1st generation CM." That's today in Belchertown. First trap catch of oblique-banded leafroller was noted yesterday in pheromone traps in our state-wide trapping network (see pict below). As stated, this starts the degree-day clock ticking per the model to time an insecticide spray targetting hatching eggs. This is likely to occur as early as next week, however, I suspect the week after to be the ideal timing. I'm awaiting a report to see if there are any potato leafhopper spotted in what is typically one of our earlier sites for this pest. 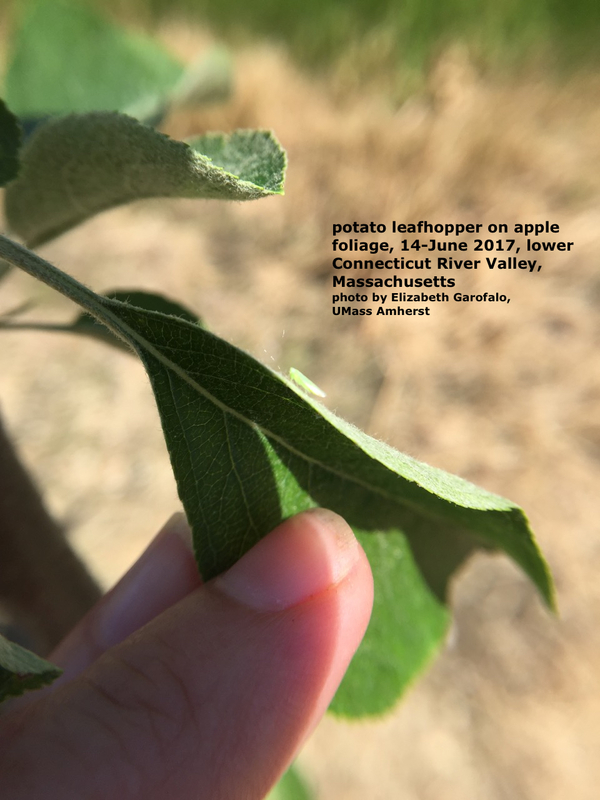 (Update: they have been found, on Honeycrisp in the lower Connecticut Valley. Picture.) Either way, it will show up sometime in the next few weeks, and I am always amazed how quickly it can shut down the growth in new plantings. So here, read this article in Scaffolds Fruit Journal and be prepared, and don't forget to scout those young plantings? 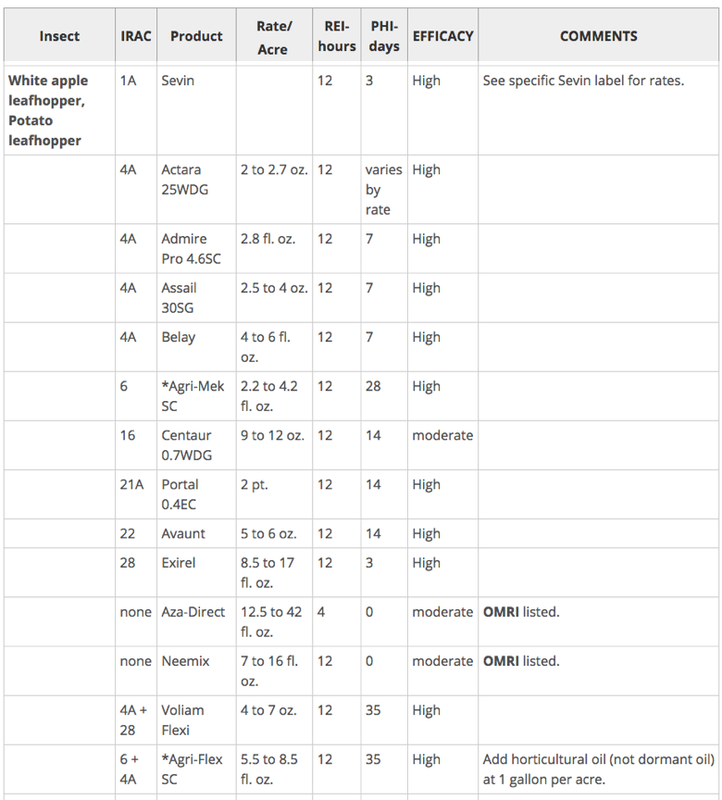 Our own leafhopper spray recommendations from New England Tree Fruit Management Guide. 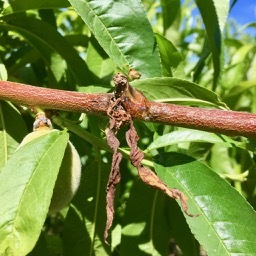 I dunno, looking around the UMass Orchard peach and nectarine fruit set is a little variable, it seems to be rather variety and maybe tree-age dependent? Anyone else seeing less-than-expected peach fruit set? 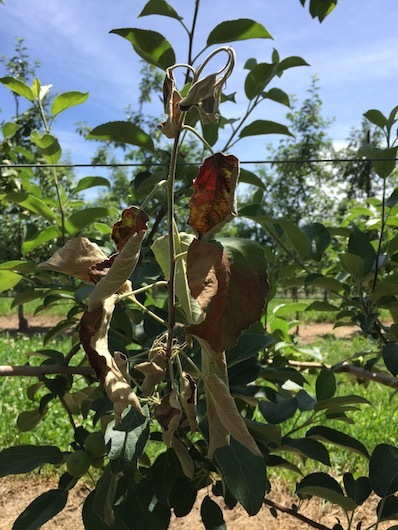 I know in our case here, blossom infection by brown rot (see pict below) has been an issue, slacking off a fungicide program last year was not a good idea. (But human nature.) This does highlight the importance of fungicide sprays druing stone fruit bloom to prevent brown rot. Some peach set could have been reduced too by the prolonged cool weather during bloom. Fire blight symptoms (knock-on-wood) has been pretty non-existent. That could change any time so we will see, but certainly fire-blight infected blossom symptoms should have showed up by now. The risk of fire blight was overall pretty minimal during the bloom period thanks to the cool weather. Best to have some streptomycin on hand if thunderstorms with wind, rain, hail move through young plantings of fire blight susceptible varieties. It's getting dry enough that irrigation should be installed and running on young plantings. Soon, it will be time to turn the water on bearing orchards too if we don't get rain. Fireblight, pear psylla and potato leaf hopper, oh my! Oh, and some oriental fruit moth too, just for fun. Shoot tip flagging from OFM is beginning to show up in unsprayed peach. At this time, the larva will feed within a shoot tip and then move on to the next after hollowing out the first. The larva can also be found moving into young fruits. These larvae will soon pupate. 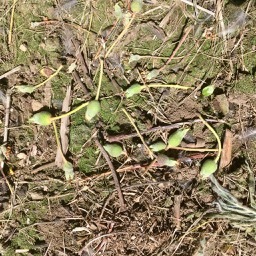 Upon emergence, the second round of adults will mate and lay eggs. Mating disruption should be hung before (like now) this mating occurs to reduce fruit infestation of this second generation of larvae. I went back to look at RIMpro, and discovered that while it focuses on a sooty blotch fungus (Peltaster) and the NEWA model focuses on a flyspeck fungus (Schizothyrium), they are not far apart in the way that they look at SBFS. Looking at output from NEWA for today, June 14, in the picture below, the table tells us that the risk is high, high, high – all red. It looks scary, like something should be done, maybe a few days ago. That’s because the NEWA model is conservative. It starts counting leaf wetness hours at petal fall, and when 170 have been accumulated, it is time to spray a fungicide. The NEWA table gives days since petal fall, then Accumulated Leaf Wetness Hours, and then an estimated risk level – high, medium or low. At low risk, no SBFS fungicides are needed. 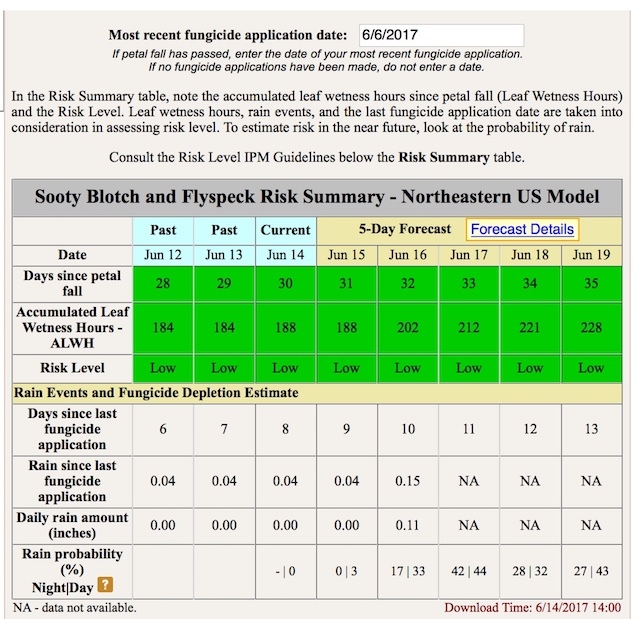 At moderate risk, a fungicide is needed if rain is predicted over the next few days. At high risk, an SBFS fungicide should be applied. The NEWA model assumes that SBFS fungi can infect fruit as soon as they are formed. SBFS spores germinate on fruit surfaces, and grow hyphae, microscopic thread-like tissue that spreads on the fruit surface whenever the humidity is very high or fruit are wet. If there’s a lot of wet weather, they grow quickly; if there’s a lot of dry weather they grow slowly. Eventually the fungi reach a point that they’ve grown enough to become visible to the naked eye – the blotches and spots of SBFS. The key to management is to stop their growth before they hit that point. Fortunately, several fungicides, including Topsin, Flint, Sovran, Pristine and Merivon, can stop the growth of SBFS fungi. Captan is moderately effective against SBFS, and it’s recommended that half of the max. label rate be added to the systemic fungicides for resistance management. There is no need spray while the fungi are invisible. Spaying can wait until just before the time when SBFS blemishes are predicted to appear. Again, NEWA estimates this is at 170 leaf wetness hours from petal fall to trigger the first SBFS fungicide spray. In reality, it generally takes at least another 25 hours of wetting to produce visible SBFS. Using 170 hours is conservative. Figure 1. NEWA output for SBFS for Belchertown MA on June 14, 2017. It’s important to put in the correct petal fall date. The default date in NEWA is often incorrect. NEWA says that it has been 30 days since petal fall, and that 188 leaf wetness hours have accumulated. This is enough to generate a high risk of SBFS infection. When did SBFS risk first hit “High”? To find that out, simply set the “Date of Interest” on the left side of the screen to an earlier date. In Figure 2, it’s set about a week ago to June 6. After hitting calculate, it shows that SBFS risk first became high on June 7. June 6 would have been the ideal time to spray. Figure 2. 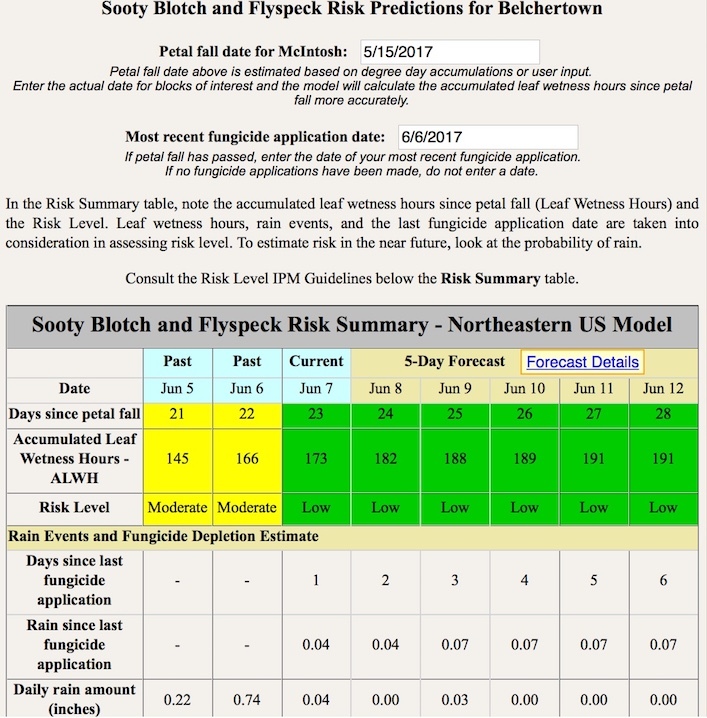 SBFS risk at Belchertown on June 6, showing that is the date when risk shifted from “Moderate to “High”. Once the first SBFS fungicide is applied, then the need for additional sprays is based on how much rain has fallen, or how long it has been since the last fungicide application. See the table below. Table 1. 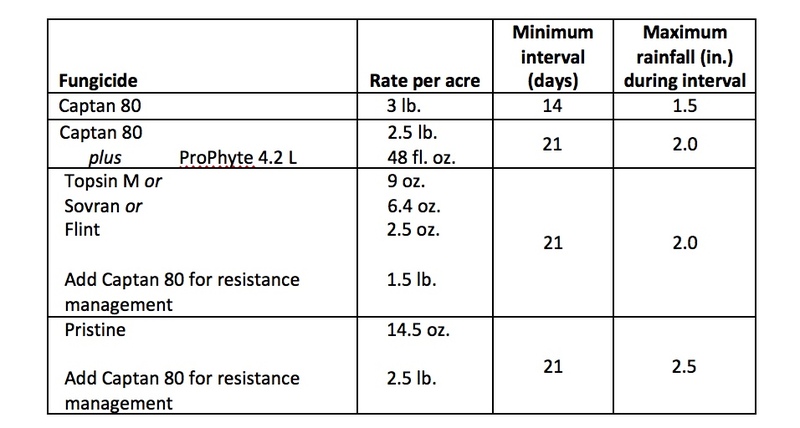 Retreatment intervals for different fungicides following the first SBFS application. NEWA helps with that as well. It tracks the days and rainfall since the fungicide application entered in the Most Recent Fungicide Application box. 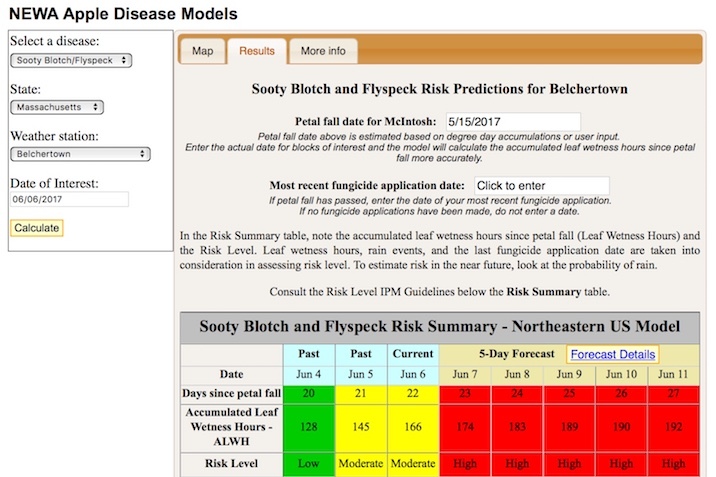 In Figure 4, it shows that today, and for the forecast period, the orchard at Belchertown will have a low risk of SBFS, thanks to that June 6 fungicide spray. It has only been eight days, and only 0.04 in. of rain have fallen. Figure 4. NEWA output tracking days and rainfall since a June 6 fungicide for SBFS. For Pears, Miranda-Sazo and Dan Donahue say: Four applications of 5-7.5ppm NAA starting next week to stimulate flower bud initiation. 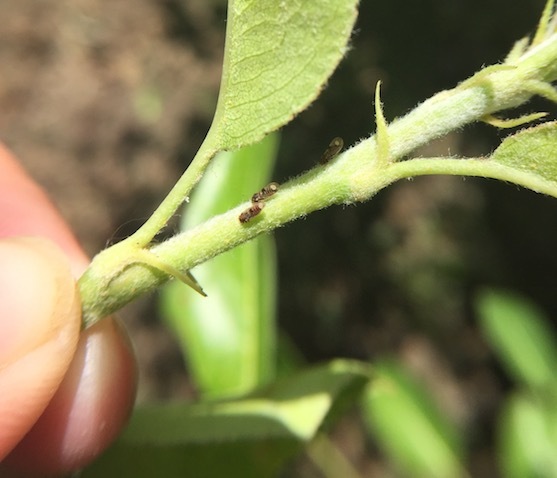 Avoid return bloom sprays of NAA if temperatures get in the high 80’s/low 90’s since application of these materials in hot weather or just prior to multi-days of hot weather might contribute to leaf yellowing, early ripening, smaller fruit size, and/or yield loss if rates are high. The next Healthy Fruit will be published on Tuesday, June 20 or thereabouts, 2017. As always feel free to get in touch with any member of the UMass Fruit Team (http://extension.umass.edu/fruitadvisor/team-members) if you have questions or comments.